Weather and Nor'easters aside, a solar-friendly environment isattracting investment to Massachusetts, including Green State Energy's recently completed 4-MW project in the town of Sandwich. The weather patterns of New Mexico and Massachusetts are about as different as they could possibly be-and New Jersey-based solar power developer Green States Energy (GSE) was reminded of that fact recently. Two nasty winter storms, called Nor'easters, tore through the company's Sandwich, Massachusetts, solarpower project last winter-one damaging some of the partially-assembled solar power panels on the $11 million 4-MW solar power project. When combined with some permitting issues, this caused a three-month delay in the project's completion. After the storm winds subsided, GSE worked with its project contractor, S&C Electric Company, to put the turnkey, fixed-price project back on track, and it was completed in May. Given the quality work that S&C Electric Company had done for GSE earlier on a turnkey, fixed-price 2.5-MW solar power project in Roswell, New Mexico, that entire project team was enlisted to work on the Massachusetts project with the hope of finishing by January 2014. Mother Nature had other plans. Dan Girard, director of business development in the renewable and energy storage division at S&C Electric Company, says that the damage done to the Sandwich solar array was more a consequence of timing than anything else, as the project was about halfway through construction when the worst storm hit, requiring the replacement of a couple of sections. "Weather certainly wasn't our friend this past winter," added Stephen Clevett, Green States Energy CEO. "S&C Electric Company, as well as Green Earth Developers, who are our on-site project management arm, were excellent throughout the process. And while we did suffer some delay, they certainly worked tirelessly to ensure the impact was minimized." The solar power generated from the Sandwich project will be purchased by the Town of Sandwich-the oldest town on Cape Cod-under a net metering program with NStar, the local electric utility, and it will provide enough power for approximately 500 homes. "This is another milestone event for our company and our shareholders, continuing our pattern of strong, sustained growth," says Clevett. "It wasn't the Sandwich location per se that attracted us to this project, but the overall economics. That said, Sandwich has been great to work with, and as a former resident of Massachusetts, I have a strong affinity to Cape Cod." Green States Energy currently owns 11 operating solar power plants in the U.S. and has one under construction. Its project pipeline comprises more than 100 MWs that includes solar, biomass, and co-generation/combined heat and power projects. Its ultimate goal is to add another 100 MWs of clean energy projects by 2017. The Sandwich project will add approximately $13 million to GSE's asset base, bringing the company's total asset base to just under $70 million, comprising just under 15 MWs in three states. Girard says that S&C Electric Company has developed a good working relationship with GSE. S&C Electric Company is a renewable energy integrator that works with solar power project owners, grid operators, and utilities to help bridge the development and integration of new solar installations among these three parties. Founded in 1911, the Chicago-based company has a long history working with power utilities and is noted for being a global provider of equipment and services for electric power systems. It designs and manufactures switching and protection products for electric power transmission and distribution, having worked with every utility in North America. It also does engineering, procurement, and construction of solar and wind power generation projects, as well as energy storage installations. It will often conduct pre-feasibility studies for clients once they have expressed an interest to install a solar project of a certain size within a certain area. S&C Electric Company, given its experience and connections within the power generation industry, will perform all the technical work to determine the feasibility, connectivity, and cost of a planned project so clients can make an informed decision whether to proceed. Girard says its experience definitely provides the company with a competitive advantage and benefits their clients. For example, on the Sandwich solar power project, S&C Electric Company had previously worked with the local grid operator, National Grid, and had a good understanding of its equipment and tie-in requirements. "That has helped us to be able to integrate the power generated by our customers on a more timely basis," says Girard. He adds that because S&CElectric Company also has a good industry reputation and can provide projects on a turnkey, fixed-price basis for its clients, the projects are more "bankable". "We end up providing a complete wrap contract to customers so that when they go to the bank, they are looking at a very bankable company that's been around for 103 years," says Girard. GSE became involved in the Sandwich solar endeavor last August by purchasing the partially developed project from Howland Development Co. Howland had done the permitting and some prefeasibility study work that S&C Electric Company developed further. The solar power generated from the project is purchased by the Town of Sandwich under a net metering program with NStar, the local electric utility, and it provides enough power for approximately 500 homes. "Normally, the original developer does not take the project completely through to the finish," says Girard. "They do all the land and siting issues, and then companies like Green States Energy come in and build out projects and maintain ownership after they have the project." As with the New Mexico project, S&C Electric Company worked with Charlotte, North Carolina-based Green Earth Developers LLC for physical construction, including installation of the racking system, solar panels, and construction management for the DC systems and AC interconnection. The ground-mounted, fixed solar array consists of 15,037 panels on 16.5 acres. Panels were provided by JinkoSolar Holding Company and Trina Solar Limited. The racking system was provided by Shoals Technologies Group, while the inverters were supplied by AE Solar Alternative Energy. ABB supplied the step-up transformers for the inverters, and Draker provided the data acquisition monitoring system. Girard says that there were pros and cons to constructing a solar power installation in Massachusetts. "The solar resource is not as good as it is in New Mexico," he says, "but the tax reasons are what's driving the investment that is occurring in Massachusetts. Business opportunities are very much being driven by political goals and that includes both the state government and federal government." The state is known for its openness to solar development and has set a goal of achieving 400 MWs of solar power production. In 2003, it was among the first states to adopt a renewable energy portfolio standard (RPS), which requires distribution utilities and power generators to secure a percentage of their electricity from qualifying renewal energy units. The state developed new regulations in 2010 dedicating a certain percentage of that RPS solely for solar power development. The Sandwich project qualifies for Solar Renewable Energy Certificate (SRECs) units issued through the Massachusetts Department of Energy Resources (DOER). Utilities can purchase these SRECs to meet the state's RPS goal. It was GSE's goal to start selling the SRECs by January, which is one reason it selected S&C Electric Company as their project developer, given the aggressive timeline it had for completion of the project. In addition to the wide gaps in temperature, the terrains of the New Mexico and Massachusetts projects are also quite different, with a flat desert installation environment in the Southwest versus a more wooded environment in the Northeast. 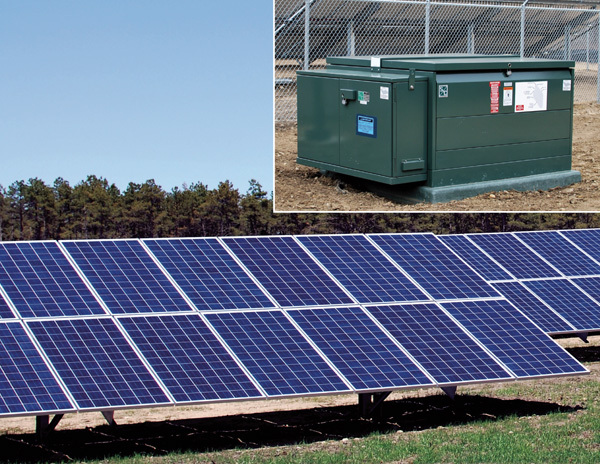 Additionally, the colder weather in Massachusetts compared to New Mexico required S&C Electric Company to make some adjustments in its equipment selection; such as inverters that perform well in this environment. Polycrystalline solar power systems actually produce more power in the cold. "Some of the highest production on any solar systems is actually in a high arid environment-like at 8,000 feet in New Mexico," says Girard. "Heat does drive your inefficiencies up slightly for a polycrystalline system." also had to address some environmental issues on the Sandwich site, which required the company to consult with environmental experts. One issue involved the protection of box turtles; the second was protection of a specific moth species. Regarding the box turtles, the solar array was constructed so that the normal pathways used by the turtles were not obstructed. "In the area where the moths were located, we basically decided not to build in that particular area," says Girard. "We've had to protect birds and bats before, but this is the first time we've had to protect moths." Now that the project is complete and operating, S&C Electric Company has been contracted by GSE to provide operation and maintenance on the site, as well as monitoring through its global monitoring center. 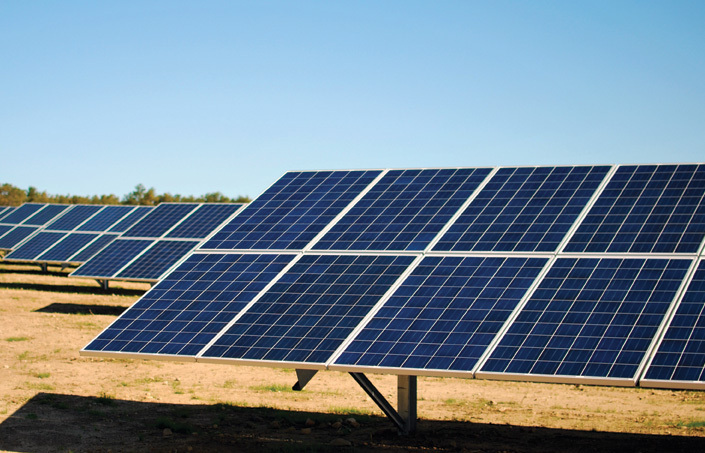 GSE has other solar power development projects in the pipeline in Massachusetts. "We like the Commonwealth of Massachusetts in general for solar projects," says Clevett. "For us, it comes down to economics. The attraction of Massachusetts for us has centered around the stability of the state's SREC program coupled with the availability of net metering. We are in fact working on several development stage projects in Massachusetts and would be very pleased to expand our footprint in the Commonwealth." This includes the company's 3.6-MW Devens project, which came online this summer.